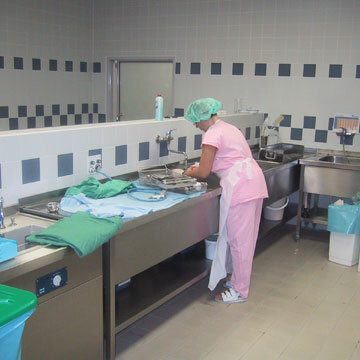 Washing tables - BMT Medical Technology s.r.o. The basic design elements are made of first-quality stainless steel DIN 1.4301, AISI 304. All edges and functional joints are perfectly welded to eliminate the contamination risk. The surfaces are ground and offer an elegant uniform appearance with all furniture pieces. 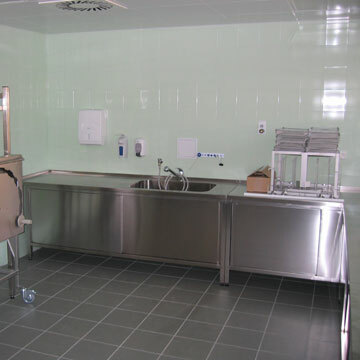 This surface is identical with the paneling of steam sterilizers or with optionally manufactured stainless steel walls. The surface of sinks is polished. 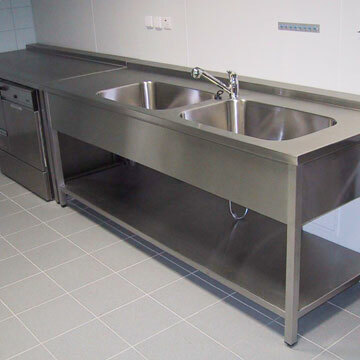 The integral line of washing tables is available with the standard depths from 400 to 800 mm and widths from 800 to 1900 mm. The standard height is 850 mm. The tables can be provided with a rim or an offset according to their specification. The lower part of the table can be free or provided with shelves or support cabinets. 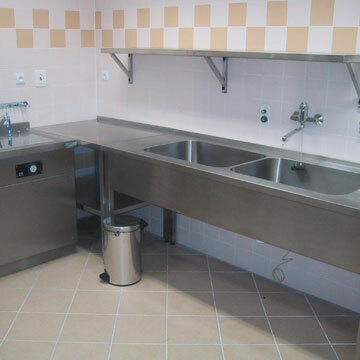 The tables can be provided with one or more sinks.The type and location of the tap is adapted according to individual needs. Due to the ergonomics and easy cleaning and disinfection of surfaces these washing tables are suitable for all workplaces in medicine, laboratories and public catering.